question is: will it work? 8hp euro. graphic design is prob not final - laid it out quickly. pcb would obv be bracket mounted. Thanks! Another question: are there any mods that could be done? Like adding a potentiometer that will be able to mix lp/hp and have an additional output jack? Basically a notch I guess. Or adding a 2nd cv for resonance? I've got a rough sketch of a 1.5" wide frac version of this and the filter should be here soon. It will be a denser, possibly having an input level control and a 2nd CV in. Once I'm sure the layout and features are going to work I'll ask you to make me an acrylic panel for it. There's these simple little vactrol PCBs which should be about 1 Meg when the vactrol is off. It might be worth trying that as a feedback path to implement a quick and dirty VC resonance. Maybe somebody who has played with them will comment. You could put the HP on one leg of a pot and the LP on another and take the "Notch" signal from the wiper. You could also run the red wire from CF2A (pin 1) that goes to the top of the resonance pot into a VCA input and run the white wire from CF2A (Pin 2) that goes to the wiper of the resonance pot to the output of the VCA. As long as the VCA provides unity gain at full CV, it will work as a VC resonance. You're just working the feedback loop at that point. Which is all that the pot does. No need for a vactrol. Love it - now a panel redesign is in order! Revised panels attached... 6HP. Hoping to squeeze them to this width. They look great! but, huge. 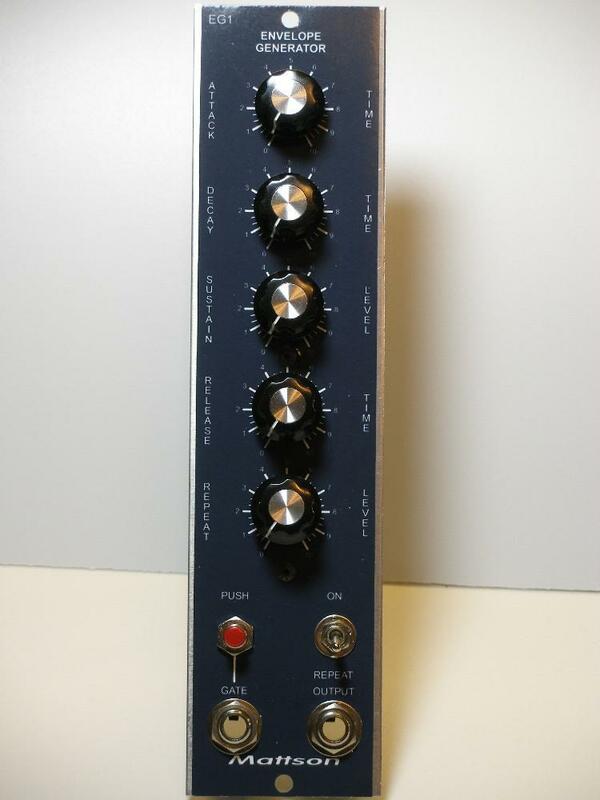 How about designing some 5U faceplates in Dotcom format? that could happen - but I guess it might have to be specific to mounting hardware. The PCB could be bracket mounted for 5U as well, using the pots to secure the bracket, or screw holes could be drilled for the self tapping right angle brackets that George can supply. No, I don't have 5U parts in stock. The pots don't matter and the LED's just stuff in a 1/4" hole, switch styles are up to the individual taste. Here's a 5U EG I threw together just to show it could be done. I don't have any sort of cabinet to mount it in but, it makes a good example. My pots? They'll fit over the shaft but, they're a bit short. I ordered mine with longer shafts so I could put the cover on it and still let people manipuate them without needing tweezers. Mine have the standard splined shaft, F(oh) and Harvestman knobs fit them even though they sit a tad bit high off the panel. My bushings are 7mm. I received double mounting nuts so I could use one for a back adjustment (like they do with switches) My shafts are 13mm from the bushing to the tip. You're welcome. Did it help? PS, without sounding weird, I put two nuts each in your bag. It will in the final decision making for knobs. they always come in pairs. I'm having a Woody Allen flashback. Looks good, but the 3 jacks in a row at the bottom are probably going to be tight. Even if you fit the jacks in, remember that most cables have bulk around them and you need to leave room to plug them in beside one another. Keep us updated, I'd like to see the finished thing. I'm thinking about taking the MMM filter and doing a 5U dotcom panel. Just thinking about options at the moment. I have some Euro but I'd like to move over to 5U instead.